Elizabethan-style music starts. A male and female dancer appear together, one with yellow sweatshirt sleeves and the other with green. Their serious presence is like a wordless prologue, similar in mood to that of Romeo and Juliet, which famously begins with: "Two households, both alike in dignity." Together and separately, the dancers pray and slowly put on the various costumes of war, including a metal battle hat and a white-billed cap. The second piece is a trio of three men dancing in rhythmic pop-and-lock canons that suggest machinery. Donning a blend of armor and sports fashions, they blur the lines between time periods. Crowd-stoppers include a dance-off to a cover of Frankie Valli's "Beggin'." Another is a story about King Andre, a medieval leader who comes back from the dead to seek revenge against a team of grave robbers. 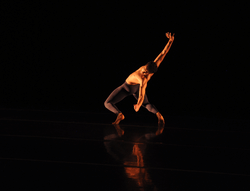 These pieces reveal the dancers' range as athletes. They often drop to their knees or twirl on their toes. As actors, they never break character in the 30-minute show they repeat three times in an evening. Guests wandering the galleries do double-takes, glancing from the collection to the dancers, who are in their 20s—roughly the same age as real knights. After the first show, a little girl and her mother wait near the "stage door," a fortress of office dividers near a back stairwell. They're here to talk to Flexx, a strikingly tall dancer with long braids, who's associate artistic director of It's Showtime NYC! They've seen him in various venues around town and wanted to say how much they love his work. Flexx, whose real name is Kester Estephane, answers their questions about his chest guard and leg pieces. The chest guard is bulky, but the leg pieces are jointed and allow him to move differently than he normally would. "There's something about the show that makes visitors itch to talk to the dancers," explains Terjanian, who hoped to put the objects to the test. Common questions include the weight of the pretend armor versus priceless items in the museum's collection that the dancers are not allowed to wear. A medieval German mail shirt is almost 15 pounds, Terjanian says. The replica worn by the King Andre character is close to 23 pounds. In a similar comparison, a real arm guard, known as a gauntlet, weighs one pound, but the reproduction is almost three times as heavy. With support from his department, Terjanian bought authentic reproductions from an auction in France. During the summer of 2018, the dancers learned about the armor and the traditions behind it. Best of all, they got to play with it. 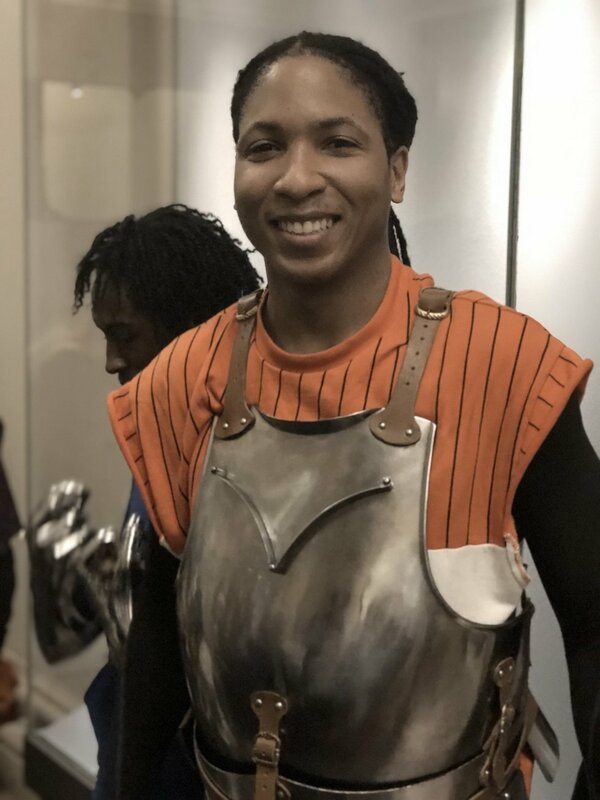 "My team made kits of armor for them to try without knowing the dancers or their size," Terjanian says. "I provided the venue and the context. I never edited them." To his amazement, one mild-mannered performer put on gauntlets and immediately wanted to punch something. Armor inspired the troupe's choreography, which continues to evolve over time. So do the costume pieces that are beginning to rust and accumulate scratches, just like real suits of armor that tell stories about their owners. "The sheer act of wearing it can change the state of mind," Terjanian says. "It's almost like going from Clark Kent to Superman," says Flexx. Rhea "Wiildkard" Nance, associate administrative director, says the gallery's space is also transformative. Nance, the only female in tonight's lineup, often performs on subway platforms. Unlike dancing in the cars, platform dancing is legal, an iconic part of New York culture. But street dancing in a massive museum is odd and unexpected. "It makes you channel into that confidence to make you own the floor," she says. Tonight's shows attracted 1,400 visitors, according to museum statistics. While Terjanian says that any style of dance might work with armor, hip hop especially spoke to the immediacy and tension of war. When setting choreography in museums, he suggests dance educators think in terms of effective sound, safety of performers and crowds, and the development of vital partnerships. Battle! 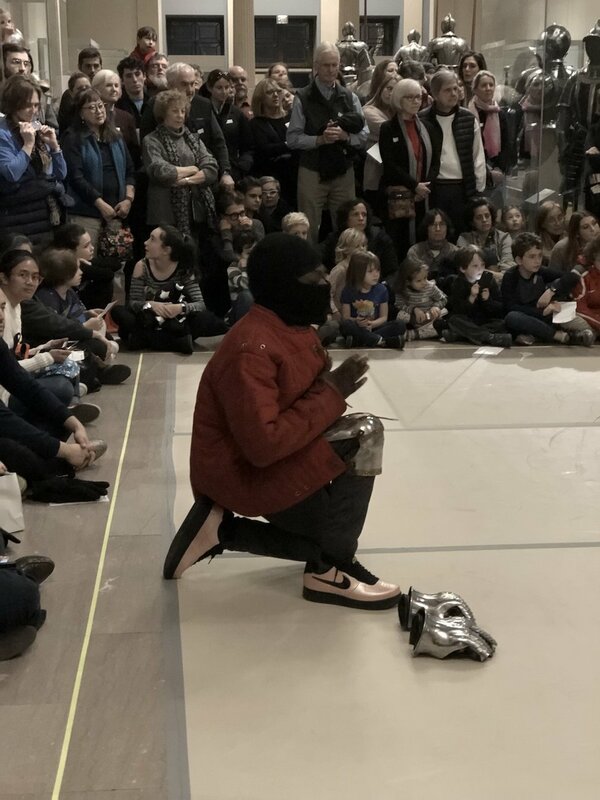 Hip-Hop in Armor was commissioned by It's Showtime NYC!, the Arms and Armor Department, and MetLiveArts, which offers on-site performances related the museum's collections and exhibitions. The next cycle of dance battles is February 8, March 22, April 12 and June 7.